I've been working up some loads for my P45 and have been having some difficulty with many rounds getting caught up in the barrel/not fully going into battery and causing the slide to freeze shut. With this I carefully place the slide on a bench and forcefully press down to eject the round. I'm using 200gr Missouri .452 lead hi-tec bullets with an OAL of 1.255," crimped to .468, over 5.5gr of Win 231. Dies are RCBS with a Redding taper crimp die. The dimensions match Blazer Brass rounds that function just fine. The only variable is likely to be significant in that with the plunk test my round sits just a bit higher that the Blazer rounds. What adjustment to I make to cause the bullet to sit deeper with the plunk test? Thanks. 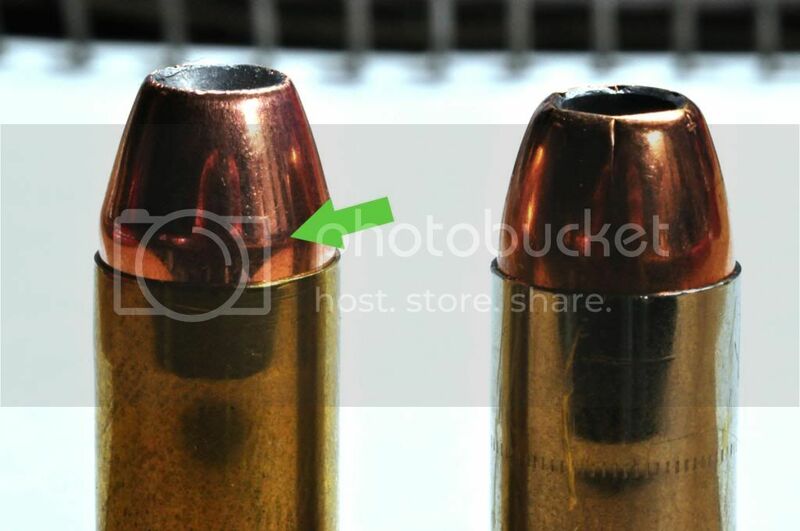 What shape is the bullet "Oddball/SWC/IDP#1/grooveless, Missouri sells them all in 200gr? I will bet the OAL is too long. Remove the barrel from the gun, put a bullet in the chamber, it'll stop when it hits the rifling, slightly oval a fired case and push it into the chamber over the bullet until the case mouth touches the step in the chamber. Carefully push the bullet/case assembly out from the muzzle. Carefully measure the assembly without pushing the bullet deeper in to the case. This measurement is the longest OAL for this bullet and should be at least 0.010 shorter when loaded. If you don't mind pulling bullets you can assemble dummy rounds (no primer no powder) with 0.010 shorter increments of OAL, and try them in the barrel chamber (not the gage) until short enough to seat. Also check a round that "got caught up in the barrel" for marks on the bullet where it jammed into the rifling. Following along with what Tilos wrote, my experience with my CW45 was that the leade/free bore was too short for some bullet profiles. Had the CW45 at the range today, along with a bunch of other stuff. Pulled the CW out to try the new Fiocchi XTP defense ammo I just bought. Magazine, rack it, doesn't go to battery. drop the mag, rack it. That round ejects, next one jams, solid. not into battery, slide will not move. Can't rack it, can't tap it into battery. I'm stuck with an inoperable pistol with a hot round almost into the chamber. Ended the range day. put it in a padded case. Locked it into the trunk. A quick 10 minute run to the gun shop/gunsmith. 5 minutes and $25 later, all is good again. Turns out, the cone on this round is too steep to go up the ramp. Shop said it's fairly common with this short a barrel pistol. It's a Horrandy XTP bullet in a Fiocchi case. Yes factory new rounds. Off tomorrow to see if the shop where I bought them will let me swap for core bon or golden saber. Oh yeah, actually dented the tip of the hollow point. "Turns out, the cone on this round is too steep to go up the ramp. Shop said it's fairly common with this short a barrel pistol." I doubt that's the case. From what you wrote earlier, "next one jams, solid. not into battery, slide will not move. Can't rack it, can't tap it into battery. I'm stuck with an inoperable pistol with a hot round almost into the chamber. ", I'd guess that the XTP has engaged the barrel's rifling preventing the round from going into battery and also making it difficult to extract. 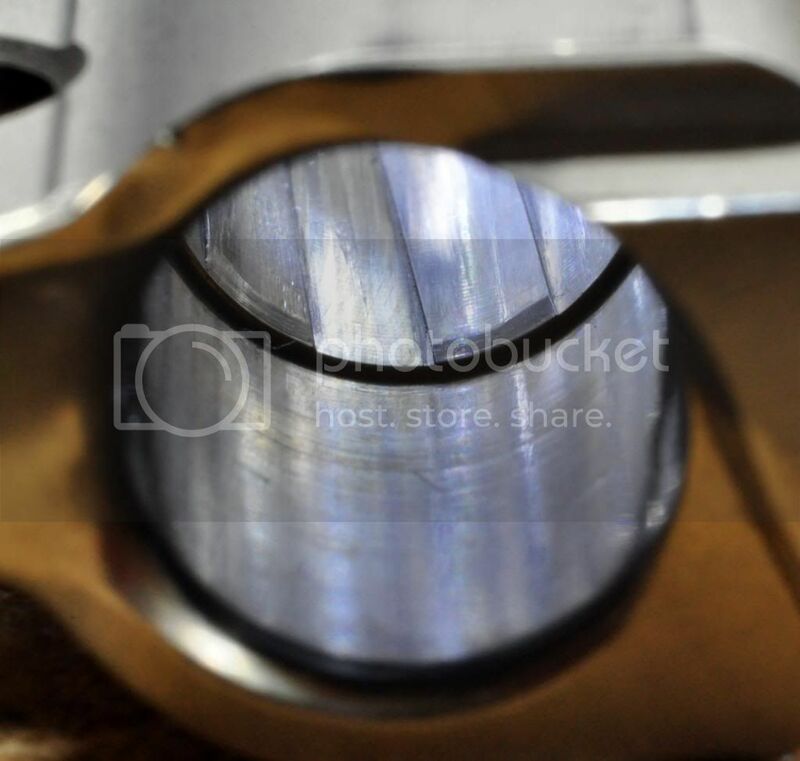 The top barrel has a short amount of free bore/leade in front of the chamber. I think it's pretty easy to see how some rounds might have a length or bullet that could contact the barrel's rifling when chambered. My guess is that your ammo will be slightly protruding (as in the far right above; the photo illustrates correct head spacing, but applies here). 1. switch to an ammo that seats flush when you drop it into the chamber and operates correctly in your pistol. 2. Return it to Kahr for repair. 3. Have a local gunsmith ream the barrel to increase the "free bore". I guess there's also a chance that your chamber is tight. If you can wiggle the round a little when it's in the chamber then I doubt this is an issue. I've read numerous posts online about Kahr's being picky about what ammo they will chamber and wont due to their tight chambers. I want to share what I found with mine tonight after I locked it up tight today on it's first trip to the range while attempting to chamber one of my target loads after 100rds of Remington factory ball ammo. I pulled the barrel out for cleaning tonight and attempted to chamber some various ammo by dropping them in while holding the barrel. I found some dropped right in while others stopped short of fully chambering. This is easier than trying to pry my action open like I had to do at the range today I found that hollow points with a pronounced shoulder on them like Hornady XTP's and the Nosler Custom Competition 185's that I love to load so much for my other 45's were what caused the problem. I took one that wouldnt chamber and dropped it in until it stopped and then grabbed the base of the shell with my fingers and twisted it back and forth about 90 deg while light pressing forward and pulled it out. The barrel is steel, the bullet jacket and shell case are soft metals so I knew the barrel/chamber should leave marks on the cartridge where it is hanging up. It was on the shoulder of the bullet as pictured below. On the left is a Nosler 185 handload and on the right is a Federal HydraShok. The Hydrashok drops right in, the Nosler does not... notice the difference in profiles close to the case mouth. The Hydrashok has a profile very similar to ball ammo until the top, so it chambers. 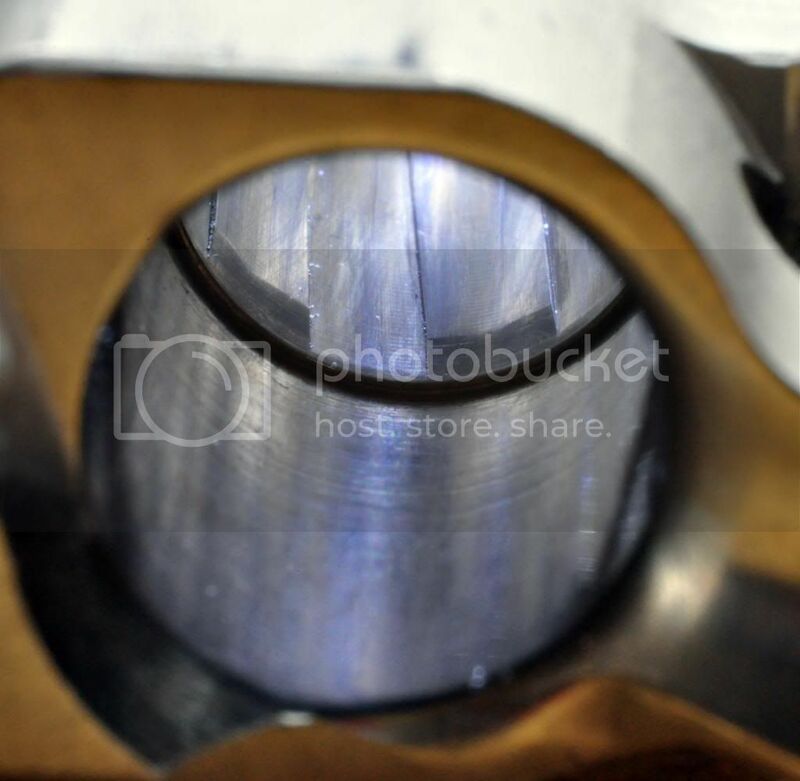 Because the marks from me twisting the cartridge in the chamber are on the bullet and not the casing, I started to look at the barrel and not the chamber. The chamber is no tighter than than my other 45's just by feeling the amount of freeplay with a cartdridge fully chambered. Pictured below is the lead-in to the rifling in my barrel. It is a steeper angle than my other 45's, but not that much different... why is it touching the bullet before the cartridge is fully chambered I wondered? As Im staring at it scratching my head I noticed that the lead-in is not uniform. Pictured above is the left side of my barrel, pictured below is the right side of my barrel. Notice the difference in the angle of the bevel on the beginning of the rifling. THIS is why it will not chamber the bullets with a more pronounced shoulder profile. Is this considered defective? Normal? I dont know, this is my first Kahr. Perhaps some of you could take a look and see if your picky eater looks like this? I could get around this by changing the bullet seating depth of my target loads to work with this gun so Im not terribly concerned about it myself at this point. I did however want to share my findings because I've read a fair amount about folks having picky eaters that wont chamber certain types of ammo. Many of the threads on various forums/reviews seem to have the XTP style bullet causing the problems. FWIW, my CW45 had this issue with Hornady 230gr. XTP. It happened with less frequency and became easier to clear as I put more rounds through the pistol, but I eventually bought a reamer and cut more free bore/leade into the barrel. Issue fixed. Thanks folks for the replies. BTW: lead round nose "oddball" bullets. I'll be away for the weekend but look forward to working on this early next week. I'll let you know how it works out. Regards, Dan. That "oddball" bullet profile has a step/shoulder, so it should be loaded to an OAL that puts that step flush with the case mouth... or below. A pic of a cartridge as currently loaded would help us a lot. Missouri sells a 9mm bullet called "small ball"(no step/shoulder) that I've loaded, it has to be seated deeper/shorter OAL to chamber in an aftermarket barrel. Other round nose bullets work at an OAL of 1.100" whereas the small ball has to be loaded to an OAL of 1.060 to plunk. Edit: Because Kahr barrels are notorious for tight/short chambers I'd measure those bullets to see if they are actually 0.452". If they prove to be larger, that could be your problem. Lee sells a 0.452 push thru bullet sizing die...but NOT a 0.451"
Last edited by Tilos; 06-10-2018 at 04:37 PM. If the cartridge is jamming at the top of the barrel/barrel hood, that usually means the COL is too short. Likewise, if the cartridge jams on the feed ramp, that usually means the COL is too long. For incomplete chambering (the cartridge got past the feed ramp and attempted to chamber properly), you need a plunk test pretty much at described above. Drop cartridge in barrel and rotate a couple of times. The cartridge will rub the interfering part of the cartridge against the barrel. 2) Marks at corner of case mouth and case body indicated the case mouth flare still exists and more crimp is needed. 4) Marks on case body about ¼" above extractor groove indicates the sizing die is not going down far enough and you probably need to Bulge Bust.